Pears are safe to eat during pregnancy; they are low in calories and contain several nutrients that are especially important for expecting moms. Add variety to your daily diet with the many pear varieties available, including Bosc, Bartlett, Anjou, Starkrimson and Comice. Although you can eat pears plain, you can also cook them in various ways or put them in smoothies to reap the health benefits. Pears provide approximately 14 micrograms of folate per piece of large fruit, according to the USDA National Nutrient Database. Although that may not seem like much, when it comes to folate, you should get as much as you can during pregnancy. Not many foods contain folic acid, which is why most doctors recommend that women of child-bearing age take a supplement that provides a significant portion of your daily intake. Folic acid is particularly crucial in the first trimester of pregnancy, when it plays a critical role in the prevention of neural-tube disorders. The recommended daily intake of folate for pregnant women is 600 micrograms. Pears are an excellent source of vitamin C. Just one pear contains about 10 milligrams, which is a significant chunk of the daily recommended intake of 85 milligrams for pregnant and 75 milligrams for non-pregnant women. Vitamin C helps your body fight infection, which is particularly important during stressful times of your pregnancy. Eat pears with foods that are high in iron, like rice and beans or meat, to help your body absorb iron. Iron deficiency is more common during pregnancy, which makes vitamin C intake more important than ever. 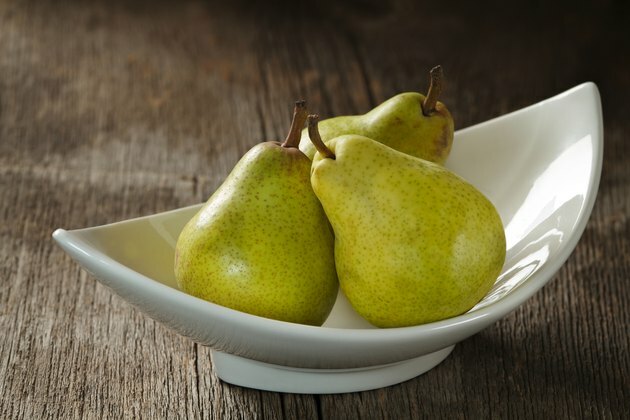 Pears are also a good source of fiber, which helps relieve constipation, a common pregnancy symptom. If you take iron supplements during your pregnancy, you may be more prone to constipation and should eat a lot of high-fiber foods. Eat pears with the peels to get the highest fiber content. According to USDA, one pear contains 7 grams of dietary fiber with just over 2 grams coming from pectin, which is a type of soluble fiber that aids in the digestive process. You may need to watch your calorie intake during pregnancy to avoid excess weight gain, but pears won't pack on the pounds. One large pear contains 143 calories, according to the USDA. Since they contain a high amount of fiber, pears are quite filling and provide a low-calorie snack that will also give you healthy energy to make it through the day. Pears contain two simple carbohydrates, fructose and glucose, which are easily digested and provide a healthy energy boost.